We’ve had a TON of interest in our butcher block counter that we built for the upstairs bathroom. For those of you that have so patiently waited for this tutorial… thank you for your patience! It was a fun build, and we’re SO HAPPY with the way it turned out! My Grandfather was an avid woodworker, and had stashed away several variations of hardwoods and softwoods in the old barn on my Grandparents’ acreage. 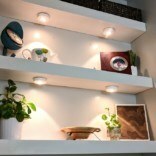 We love this because it’s sentimental AND cost effective! But you can use ANY wood. Once we got the lumber, we took it into our local saw-mill/woodworking shop and had them run them all through their planer to get the lumber all the same thickness. We were surprised to find out we had 3 variations of wood (pine, oak, and hackberry)! Note: By Buying grade Common 1 lumber will save you money for this project. 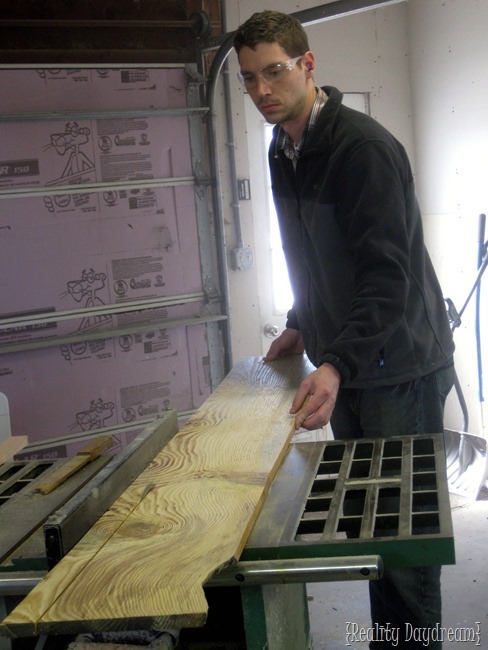 You’ll probably spend $40-$60 dollars in lumber and another $5-$10 in getting it planed. We ran all the boards through the table saw, cutting 1/4” thicker than then I wanted the final thickness of the counter top to be. I set ours at 2 1/4”. 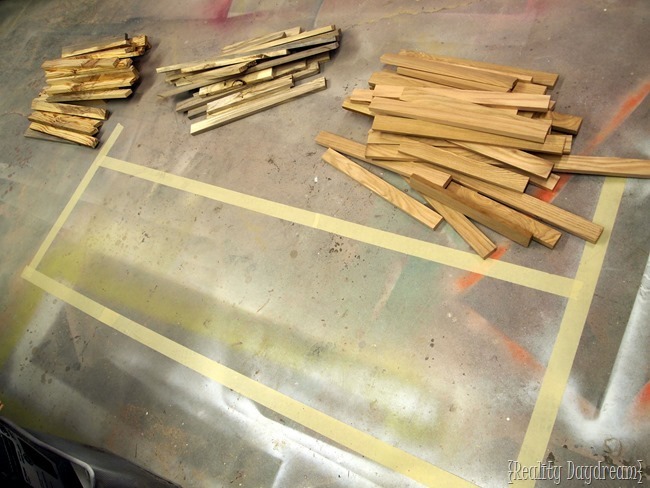 Once I had all the boards cut to width, I cut them down into smaller random sizes using our Ridgid Miter Saw, and separated the 3 different wood types into 3 different piles. Using a flat surface (i.e floor, table, etc…) we taped an outline of the dimensions we wanted the counter. Time to lay everything out! 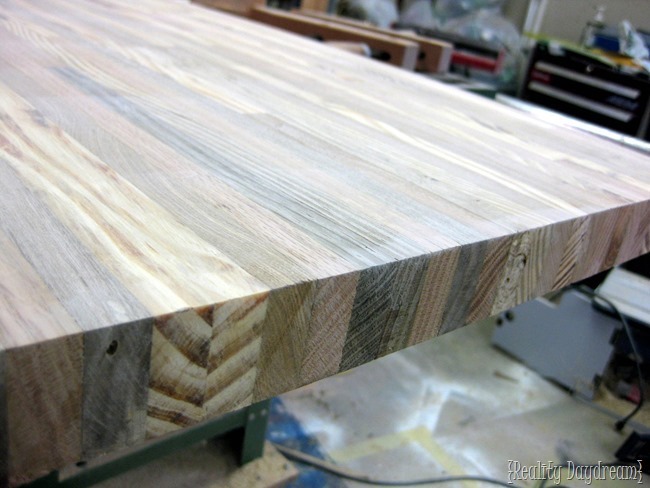 The most important thing was to make sure that the different types of wood were evenly dispersed throughout the butcher block. Every wood-type stains differently, so once the stain is added, the character of the wood color and grain is really brought out. Once everything was laid out out nice and neat, we started gluing. We use Titebond III, which is waterproof and super adhesive. 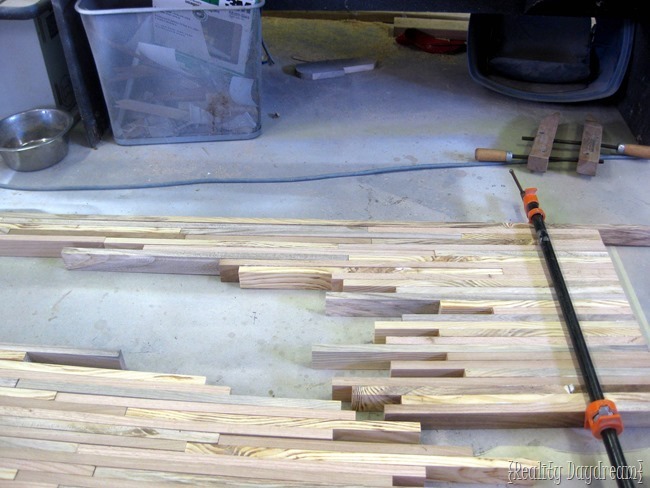 We started by gluing up the first couple feet and then clamping it down with pipe clamps. This serves as a solid stop, so we can hammer these pieces together minimizing the gaps in between pieces. Then we worked our way down, gluing and clamping as we went. 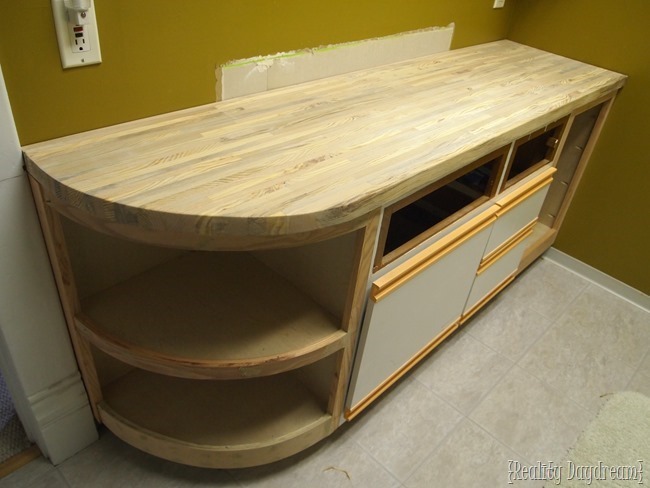 Once we got everything glued into place, we used a two longer boards on the outside edges to equalize the pressure across the entire countertop. Then flipped the whole thing over letting it rest on the pipe clamps. Caution: If you’re just using the bar clamps like the ones I have in the middle; Trying to flip it will likely cause it to collapse into the air leaving you to bob and weave avoiding the diligently placed pieces that have now turned into wooden projectiles. Okay that might be an exaggeration… but seriously, unless you want your hours of hard work to go down the drain, use pipe clamps or something that isn’t going to flex creating unnecessary spring tension. Alright kids, we leave things clamped up for a good 24 to 48 hours letting the glue set. Now we remove the clamps! 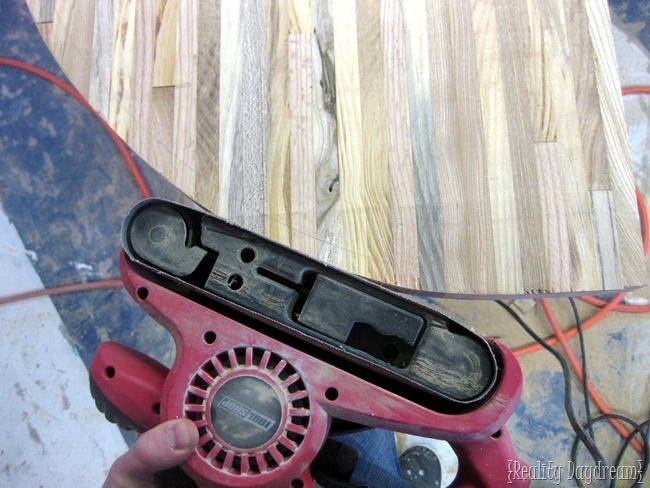 Using a square, we cut the excess off the ends, with a circular saw… cutting the length down to size. You will likely notice that the boards are not perfectly smooth and flat. Therefore we load it up once more to get it planed at the local sawmill/wood working shop (unless you’re fortunate enough to own a planer). Have them plane it to your desired thickness. Note: Check with the local woodworking shop ahead of time to see what their planning width is. 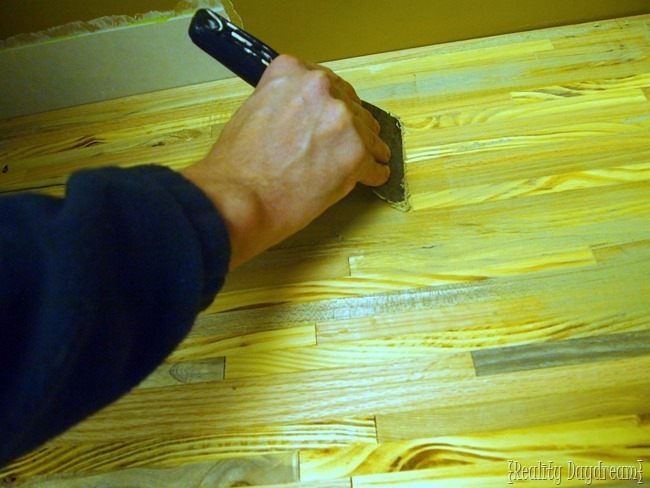 You might have to do your butcher block in two sections, (which is not a big deal) and will require you to glue and clamp the two pieces together after having them planed. Once we had the length to size we hauled this bad boy into the bathroom for a test fit! Since one side of our vanity has a rounded edge, we used a compass and traced around my rounded corner shelf… leaving the same distance the front edge of the counter. We attempted to cut the rounded edge with a jigsaw, but it just wasn’t doing the trick. So we had to take a few swipes with the circular saw. Then I used a wood rasp to rough it into shape and a belt sander to put the final touches. Heading to the bathroom yet again for another test fit! Had to get the OK from the tiny inspector too. Later that night we routed the corner’s using a 1/4” rounded corner bit and sanded the whole butcher block down. Now everything’s a GO for staining, sealing, and drilling the hole for the sink / plumbing! We used RustOleum Dark Walnut stain (just one coat), and once it was FULLY dry, we sealed with this epoxy. Be sure to follow all the instructions to the letter, because this stuff is easy to mess up! Not that we would know. Then we drilled a giant hole using a forstner bit and installed the sink! 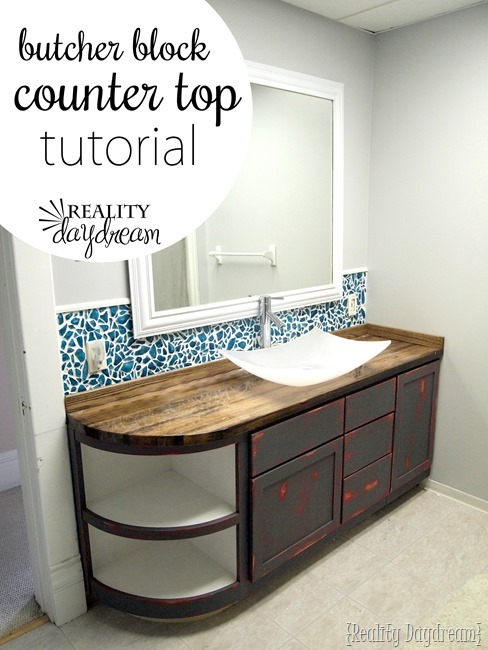 We are SO in love with the character our butcher block counter brings to our bathroom. It’s such a bold statement piece… AND it has sentimental value since the wood came from Grandpa’s barn! Check out how far we’ve COME! 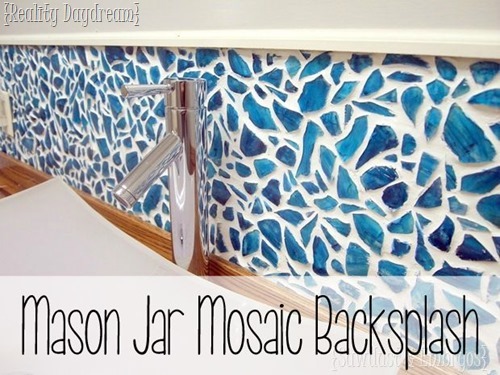 Be sure to check out the tutorial for the Mason Jar Mosaic Backsplash! It’s one of our most popular posts to date! PROGRESS: Extending the Bathroom Vanity and Building a Butcher Block Counter! This inspired me to build one. I did it for my kitchen island I built. Mine is 4×8’ and made from hickory, cherry, and oak. I also finished with waterlox instead of a poly. I love it. Had fun doing it too. I would post a pic if it would let me. I wish these comment threads would let people post pictures! You can (and should) absolutely email me pics to beth@realitydaydream.com. I can’t wait to see your work! How thick did you plane the individual boards down to? I planed each board down to 7/8″ before assembling them together. We used epoxy to seal the butcherblock. It has held up nicely over the past two years. 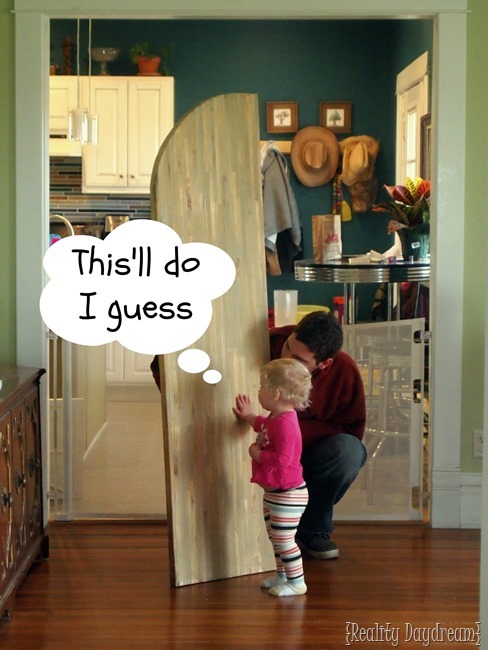 what product did you use to finish the wood? 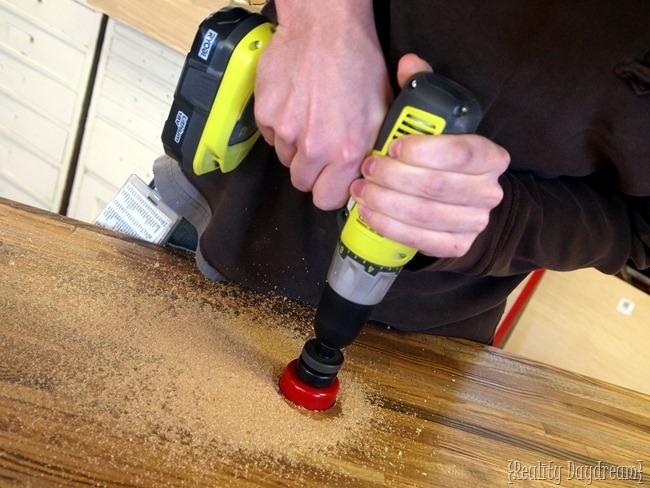 What did you use thin the wood filler? It depends on your filler… if it’s oil based (recommended) use mineral spirits to thin. If your filler is water based, use water! Hope this helps. Send pics when you’re done!! Nice counters, I’m trying to make my own and have one question. How do you put pressure on the finger joints, that run the opposite direction of your clamps? Beth, what did you use as a border at the top of the mosaic backsplash along the wall? Is it 1/4 round piece of wood? Great job! I have been building an island in our kitchen and decided to go with a butcher block top. After a lot of research I was able to find a local lumber yard (BAIRD BROTHERS) that makes these at a reasonable price. A maple top 66 by 36 for 239.00. Includes router cut on sides and tax. Again great job! California Butcher Blocks knows it is not that easy to make yours and you did a really great job! Two words: Yes and Yes! 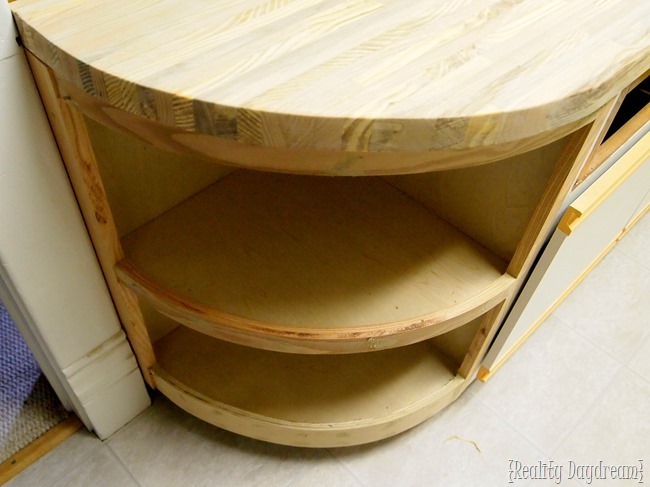 Wow – your woodworking skills are amazing! 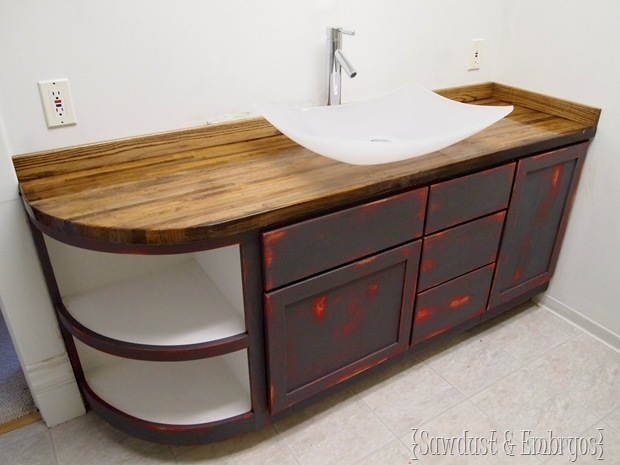 I want to redo an existing vanity. I’m going to check out your previous posts! Thanks. Just wanted to say that the bathroom transformation is awesome! Also, I’ll admit I had my doubts about how that vanity was going to turn out. I wasn’t really diggin’ the curved shape on the end with the built-in shelves. But, my doubts were all dissipated when you did the big reveal! It looks beautiful. I’ll bet you guys don’t mind spending a little extra time in there… just to sit back and admire its beauty. I love the how the counter top and backsplash turned out! 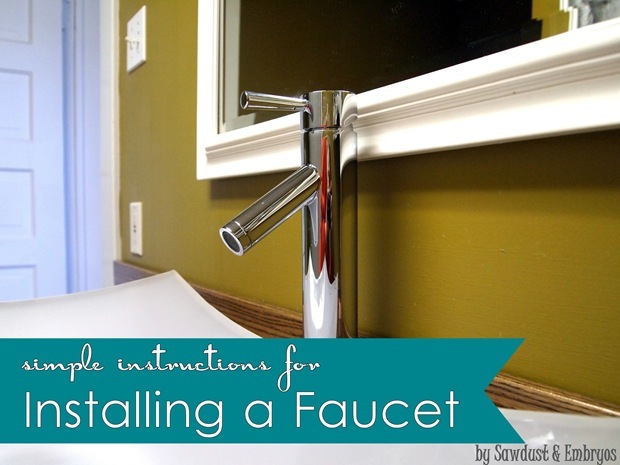 And the sink choice and faucet were perfect! you’re bathroom looks amazing, it’s really a huge difference! I love your counters!! Great job!! I hate to put a cloud over such hard work but $5-$10.00 to plane the wood? 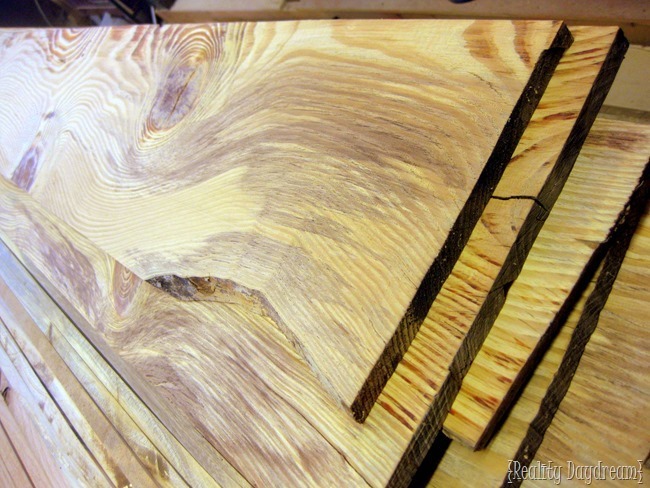 How do you find a saw mill willing to do just a couple of boards and a such a small price? Again lovely job and I don’t want to take anything away but I really struggle with that. You guys do amazing work together! Dawn, we had the wood planed twice (once before and once after the counter was assembled). It was between 5-10 dollars each time. Maybe these things cost more in your part of the country? 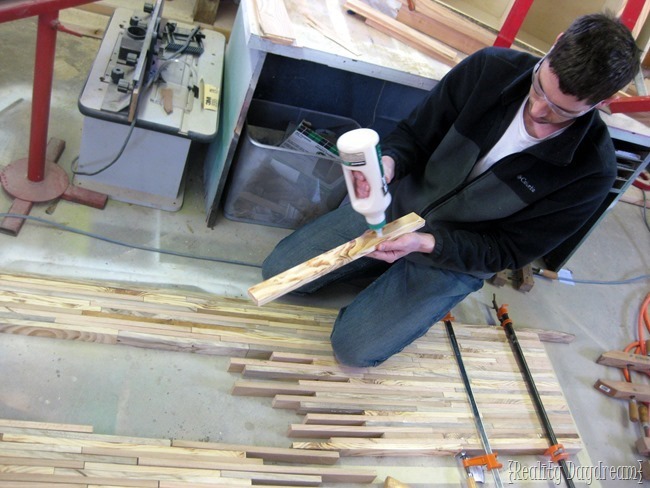 Planing wood is a very simple task and shouldn’t cost more than $5-10. My question was, how thick did you get the boards planed to? I’m guessing it doesn’t really matter so long as they are uniform, but I’d like to know if you know. Thanks! Me too. Would look great in white IMHO for what its worth 🙂 The backslash, sink and butcher block are amazingly beautiful. 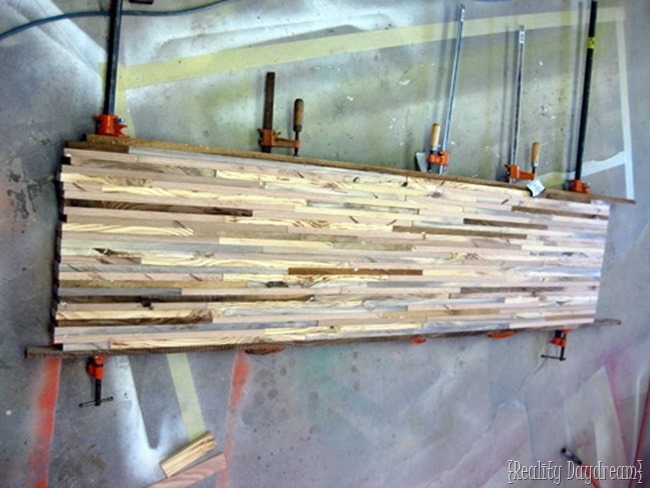 I’m bookmarking this because I’d like to copy and make a headboard, maybe with the grain vertical.Think it would work? I love butcher block counter tops! They are so classic! And they get EXPENSIVE if you order it. I feel like it’s a really solid DIY. I mean, you can’t really DIY granite counters, but butcher block is completely doable. It really puts our faux-butcher block laminate veneer counters (from the 1980’s) in our kitchen to shame. Beautiful!